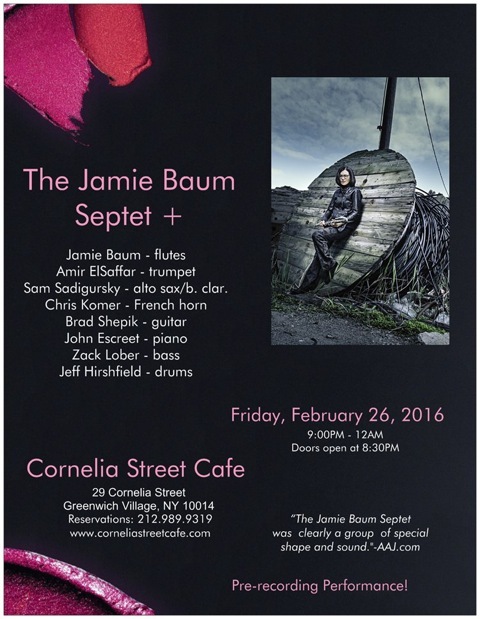 The Jamie Baum Septet+, in preparation to record their 4th CD on February 29th and March 1st, will perform all new-to-be-recorded music at the intimate Cornelia Street Cafe on Friday, February 26th. The program of original modern jazz compositions picks up where her last award-winning Sunnyside release In This Life, leaves off. Since it’s formation in 1999, Ms.Baum has used this “little big band” as her muse, first as a Septet and then adding Brad Shepik on guitar creating the Septet+, to successfully synthesize influences from disparate styles of music into her own highly personalized vision. The new compositions, performance and upcoming recording entitled “Bridges”, are made possible in part with the support awarded her by her 20014 Guggenheim Fellowship, and include a commission by the Rubin Museum of Art, Honoring Nepal: The Shiva Suite, and other cross-cultural collaborations.. Honoring Nepal: The Shiva Suite along with the other genre-crossing compositions, while staying on the side of the modern jazz tradition, are explicitly untraditional in their ethnic flavors evolved from Ms. Baum’s personal experiences. For example, Honoring Nepal is a tribute to a place she has been to twice, performing and collaborating with local musicians while at the Katmandu Jazz Festival and continuing a musical relationship with its producer and percussionist. In fact, along with pianist Manu Koch, she co-produced a benefit concert last July at NYC’s Le Poisson Rouge to raise money to for Nepal after the earthquake. The successful event featuring eight bands including Goonj Beyond Boundaries (created by Nepali percussionist Navin Chettri which Baum and Koch play in), the Claudia Quintet, Dave Liebman and a traditional Nepalese group. NYC Flutist/composer JAMIE BAUM has toured 28 countries and worked with artists as diverse as George Russell, Mick Goodrick, Paul Motion and Randy Brecker to Dave Douglas, Richie Beirach, Anthony Braxton and Wadada Leo Smith. She’s been nominated by the Jazz Journalists Association for “Flutist of the Year“ eight times including 2015, listed in DownBeat Critics Polls every year since 1998, and was included in the “Major New International Talent” 2015 list by Musica Jazz (Italy). Baum’s fifth CD as a leader, In This Life (Sunnyside Records), received great attention including reviews from The New York Times, DownBeat, JazzTimes, etc., and was featured in NPR’s All Things Considered and WBGO’s RADAR. It made several “Best CDs of 2013” lists including DownBeat, JazzTimes, Jazziz, ITunes, The Boston Globe and Francis Davis’ NPR Music Jazz Critics Poll and was nominated by the Jazz Journalists Association in 2014 as “Best Midsize Ensemble of the Year”, in the same list with only two other bands…The Wayne Shorter Quartet and Steve Coleman and Five Elements!